I love dogwood, with its perfectly simple and elegant flowers, and regret we do not have it here. I thought it would be nice to have at least an artificial flower, a beautiful copy of the real thing, so I have been looking at sterling dogwood flowers on Etsy for a while. There were some beautiful silver dogwood flowers, like these ones, by Stuart Nye. A beautiful and elegant set, somewhat Japanese in appearance - so regular, with precise lines and perfect symmetry - like a ritual piece. It dates from 1950s/1960s and is a beautiful example of Stuart Nye sterling jewelry. As far as I know, this designer was most famous for his dogwood jewelry, and I can see why. It is so clean, stylized and striking in its simplicity. Somehow it looks very serious to me. 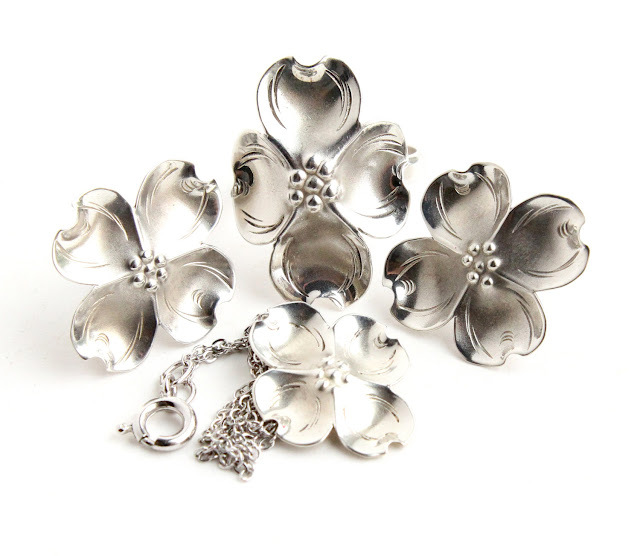 I contemplated buying a set or a single sterling dogwood flower by Nye, but decided to keep looking. I wanted something more life-like, botanical, accurate in all lines and details. Even though it is also much stylized, it looks more relaxed and playful than rather formal flowers by Stuart Nye. However, even though my first finds were beautiful, I was determined to find my perfect dogwood flower - something which would strike me as being the one, that very piece I needed. That was some spoon! The pendant is two inches across! 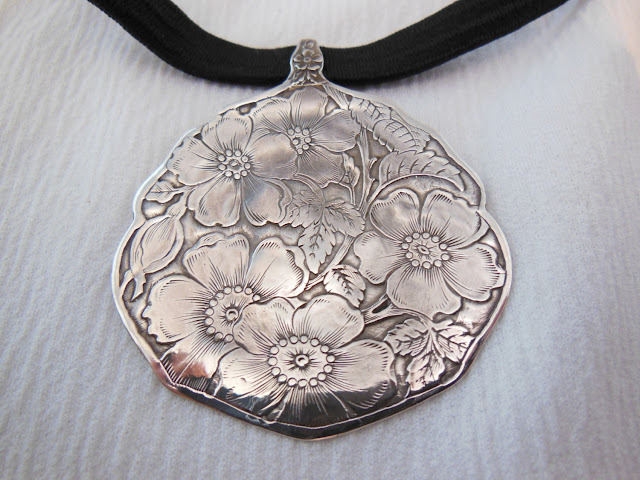 The repousse is amazing: it could come from an antique botanical print (Jacques le Moyne? ), so exquisite and with a lovely patina. I loved the design, but wanted something smaller, to be able to wear it to the office. And finally I found this. The ideal dogwood flower, so light in appearance, so effortlessly elegant, with its clean lines and minimum of details. The satin petals with softly drawn lines are amazing. The asymmetry makes it look alive and trembling in the wind. The listing says it is by Harry S. Bick and son: this was a business located in New York which was active from 1940s to 1980s. However other sources say that this mark - HSB with a line through it - was used by a Danish silversmith Hans Saugmann Bjerregaard, who designed between 1921 and 1937. I am not sure at the moment what information is correct, and will do more research on the subject. In the meantime, I just enjoy looking at this tiny piece of art. 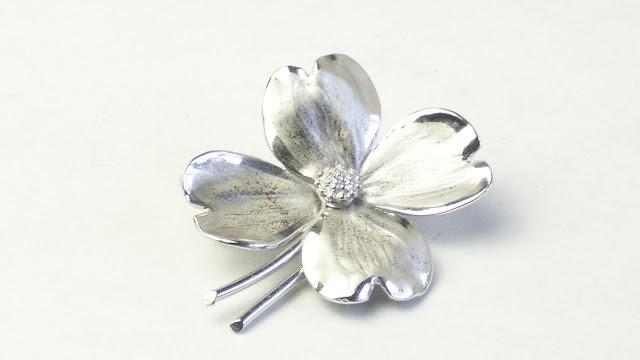 By the way, there is a similar brooch for sale here, at Silversafehouse, and it is even cheaper than what I have paid. Fortunately I do not need another one. There are also earrings from the same set at Rarejewelsvintage. These roses and stems and leaves are so amazingly detailed - you could almost use it as a teaching aid - but only "almost". They do not copy the nature, they retell it, and is not it what the art is about? I am only sharing it because I cannot afford to buy more jewelry now. However, lovely Mary has made a COUPON CODE for a 10% DISCOUNT specially for me and my readers - MULBERRY10 - thank you, Mary! Check her shop, NeedleInTheHey; there are many other beautiful items in addition to these roses. Lovely dogwood necklaces! Plus, has some great inspiration ideas.Wonderful post, thank you. I adore the brooch from welovevintage! I am so glad you liked my brooch! It can also be worn as a pendant. And there are not rare - I have seen another one recently. Those are absolutely stunning pieces! The one from 'NeedleInTheHey' is my favorite! BTW, we finally got rid of winter after 6 1/2 months of it. I hope it never comes back (except that it will, of course, the beginning of November). The consolation prize for us in NW Wisconsin is that May-October (not counting the snowstorm we had this month!) Wisconsin is absolutely beautiful and green. Thank you! I like those roses, too. I know you have winter at last! I have friends at Little Chute and Waupaca, and they keep me posted. We have had spring for a long time already, and soon there will be little green here - grass gets burned - so we will have to live under ACs till autumn. Alas, Uzbekistan is like that. These are very pretty, I like them all! 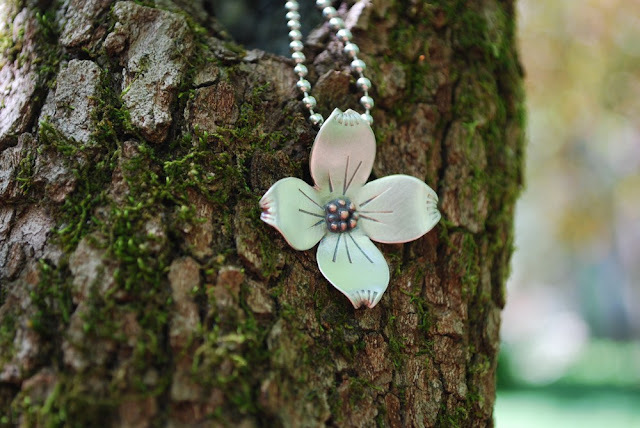 So many beautiful pieces inspired by dogwood flower! 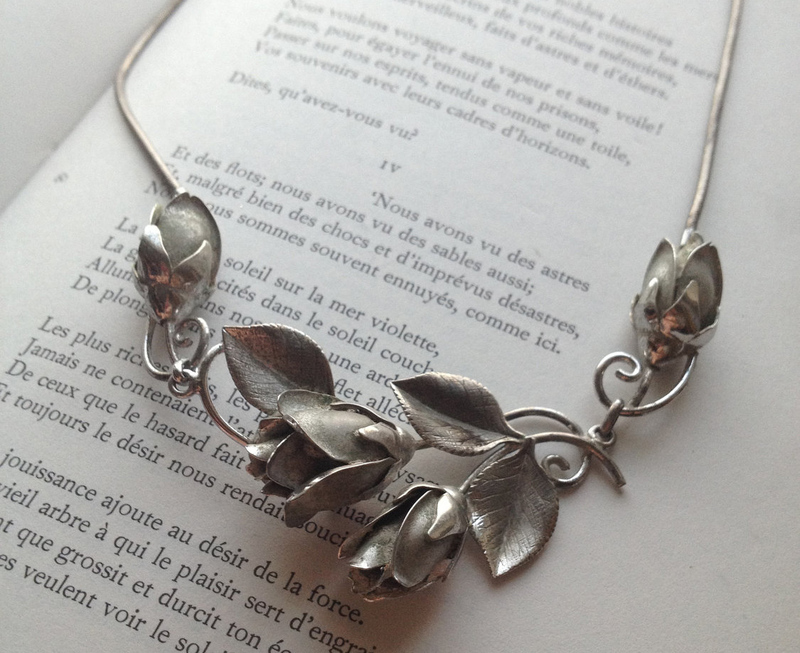 I especially love the antique silver spoon necklace! My fiancé bought me the sterling rose necklace mentioned above from Mary for my Birthday. I absolutely love it and will cherish it for years to come. It's one of those pieces that makes a good family heirloom. Congratulations - it is so beautiful! A real piece of art. Wear it in good health! Please say a few words if you feel like it - I will be very happy to read your comment. Visit MulberryWhisper's profile on Pinterest. The Classic Club Spin: And the Book I'm Going to Read is...WHAT? Six Books?? Garden Month - Growing and Sharing the Creative Fun! Boho and Modern. Jewels of my life. Hip Hip hooray for me. Man Made Seaglass Ugh How Could You? Our Favorite Rug Pillows are Back! A Happy Mother's Day to My Mother and Everyone's!